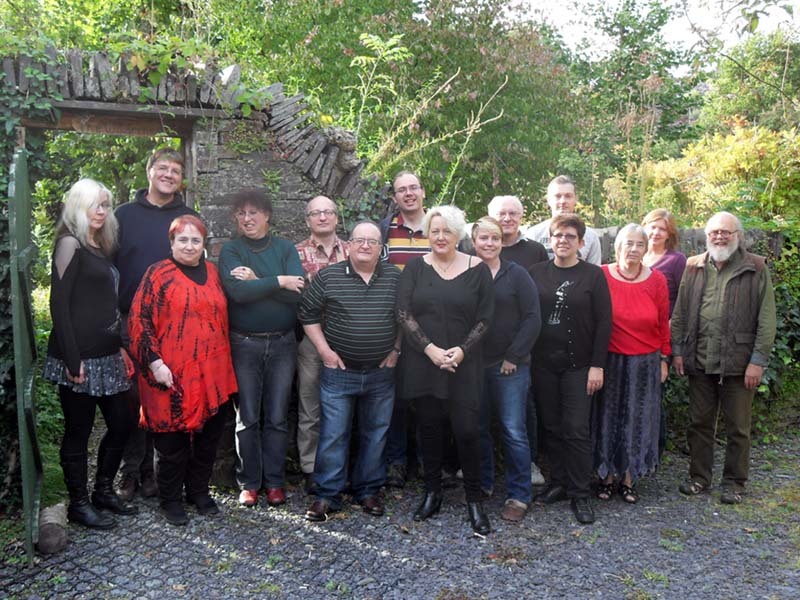 Milford Group, September 2015 L - R: Kari Sperring; Ben Jeapes, Jacey Bedford, Liz Williams, Dave Clements, David Turnbull, Val Nolan, Jackie Hatton, Tiffani Angus, Chris Butler, Sue Oke, Matt Colborn, Pauline Morgan (writing as Pauline Dungate), Heather Lindsley, Gus Smith. I gave serious thought to withdrawing from the Milford Writing Conference this year. I had, only ten days or so before the workshop was to begin, been appointed to a new job as lecturer in Creative Writing at Aberystwyth University. Thus I was in the middle of organising my move across the Irish Sea, wrapping-up prior commitments back in Ireland, and getting to grips with the requirements and responsibilities which the new position entailed. I thought that perhaps a week at Milford would be too much considering everything else that was going on but, standing outside the Trigonos centre after the first day, watching satellites and meteors crisscross the north Welsh sky and already feeling the benefits of the intensive critiquing sessions, I knew I had made the correct decision to attend. Some of this year’s participants I knew well (Tiffani Angus and I attended the Clarion Writers’ Workshop together in 2009; Heather Lindsley and I have knew each other through conventions for several years) while others such as Jacey Bedford and Susan Oke I had met briefly at cons and so forth. The majority of participants were new to me but, regardless, everyone here shared the experience of being a published Science Fiction or Fantasy writer, as well as the desire to further hone their creative practice via peer feedback and constructive criticism. Friendships and professional contacts were therefore quickly made during our week workshopping each other’s writing, dining together on the wonderful Trigonos food (yes, its reputation is well deserved! ), and sharing a few drinks in the library each evening. As this was my first Milford experience, I am pleased to report that it lived up to its reputation. Participants were not just excellent writers but highly perceptive readers of the work of others. The group functioned as a microcosm of our potential audience and was often illustrative of the different kinds of readers which one’s work will ultimately encounter (particular distinctions were evident between, say, those who want overt connections made for them in a story and those wishing to piece things together themselves, or those who prioritise scientific realism over poetic licence and vice versa). Many of the observations made have stayed with me in the weeks since the conference concluded. For instance, when we our discussion wasn’t orbiting lagrangian points (which appeared in three stories, including mine; and luckily Dave Clements was on hand to address issues of physics) we often found ourselves on the topic of trees and their symbolism for writers of Fantasy and Science Fiction. As Kari Sperring put it, in what is perhaps my favourite remark from Milford 2015: “Trees bind time together. They run between the past and the future”. For indeed, just as important as the critiquing workshops were these kinds of meandering group conversations over lunch or dinner. On any given day there was intellectual stimulation to be found in everything from the histories of Catastrophism and Uniformitarianism to the fact that “cows got really, really big in the 1700s”. The informal stretches of Milford thus offered opportunities for the knowledge (and, for that matter, the particular nerdishness) of individual participants to shine through and, in many cases, spark ideas in others. Among the new-to-me information unspooled over the course of the week was an explanation of the mechanism whereby cannibalism basically leads to the same problems as BSE and the fact that the machine for making Pringles was invented by author Gene Wolfe. While I missed the Wednesday sessions (on account of a staff meeting at my new job some two hours down the coast), I was back in time for the Milford AGM that evening. I found this to be a mature and meaningful discussion of just how the conference intends to go forward, how it aims to attract participants from a wider range of backgrounds, and how the organisers take care to ensure that the event always ring-fences slots for new attendees. Equally, the “Marketing Evening” – a discussion of what venues the participants thought the pieces workshopped throughout the week might be best submitted to – again illustrated one of the great selling points of Milford: the pooling of knowledge and experience from a variety of published authors at various stages of their careers. The discussion of agents and editors was frank and beneficial, as was our discourse about both the “hot new markets” and the shifting moods of more longstanding publications. The Marketing Evening was followed the next day by a group field trip to nearby Portmeirion, famous as the setting for the 1960s classic The Prisoner. This was a delight (I’ve always wanted to visit) even if it wasn’t strictly part of the workshop (!). Of course Milford is not for everybody (I’m thinking of the kind of author – and we all know one – who reacts poorly to, for instance, a bad review; which is to say the unprofessional writer). Robust critiques are softened with an apologetic offering of sorts (a so-called “chocolate review”) but they are to be expected because the point of the exercise is to dismantle stories and make them better. If Milford was nothing more than a dozen people telling you that you are already great then it would be worthless. Instead it is a serious undertaking for authors who wish to improve their craft. As a writer and, for that matter, as a third level writing instructor, I found it an enormously valuable experience (and, if nothing else, it introduced me to the term “anti-ditto” which I have already begun using in my own workshops!). I will definitely go back to Milford. Hopefully I will be more prepared for the heavy reading load on the next occasion (you know, by virtue of not moving my entire life to another country at the same time!) but, for now, I have returned with a wealth of meaningful feedback to fuel the revision of my submitted story. I imagine my fellow participants are all hunkered down in similar rewrites at present. I can’t wait to see the work which they shared appear in print. Matt Colborne's views on this year's Milford in his blog. Jacey Bedford's Milford entry in her 'Tales from the Typeface' blog.